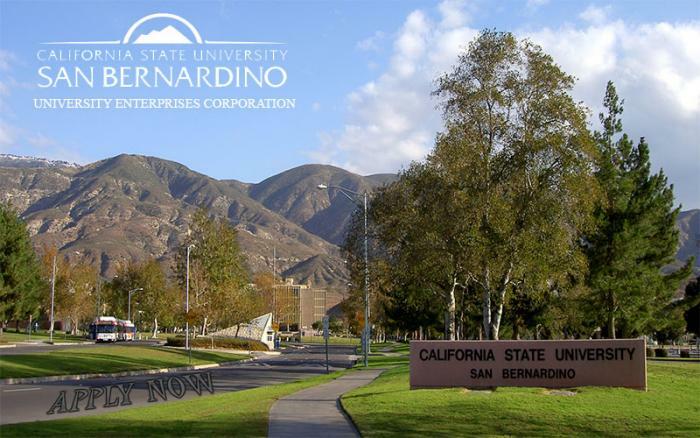 California State University, San Bernardino Joins HireVeterans.com! California State University, San Bernardino is a preeminent center of intellectual and cultural activity in Inland Southern California. Set at the foothills of the beautiful San Bernardino Mountains, the university serves more than 20,000 students each year and graduates about 4,000 students annually. CSUSB reflects the dynamic diversity of the region and has the most diverse student population of any university in the Inland Empire, and it has the second highest African American and Hispanic enrollments of all public universities in California. University Enterprises Corporation at CSUSB (formerly Foundation for the California State University, San Bernardino) was established in 1962. UEC is responsible for many activities that require financial support not provided by the state. These activities occur in all three areas of University life including: instruction, research and community service. It is incumbent upon UEC to operate an organization that is business-like in nature, at the highest level of professional competence, while also being entrepreneurial, to take advantage of many resources the University has to offer. As a recognized auxiliary of the California State University (CSU) system and member of the Auxiliary Organizations Association (AOA), UEC exists to provide the highest level of service and financial support while maintaining corporate fiscal integrity. Click Here To View And Apply To All Of University Enterprises Corporation at CSUSB's Available Positions!